Now that spring has officially sprung, it’s time to enjoy the warmer weather and longer days. 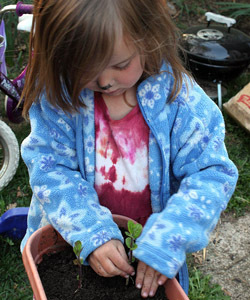 Take advantage of the change in seasons with these five outdoor play ideas, and post a comment or send us a tweet to share your own. Daylight saving time means extra time outdoors! Take a post-dinner trip to the playground and play until the sun goes down. (It’s a great way to make sure your kids get a good night’s sleep.) 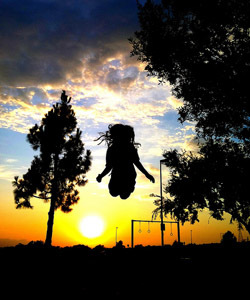 While you’re there, snap a photo of the setting sun and add your picture to our Map of Play. Photo by Hari Hamartia (cc). Don’t let the inevitable April showers deter you from going outdoors. Pull on your boots and get ready to puddle jump. 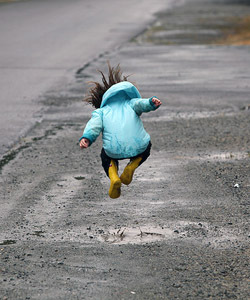 Puddles make for great natural hopscotch courses—use a small rock to determine where to jump next. Photo by cabby dave (cc). 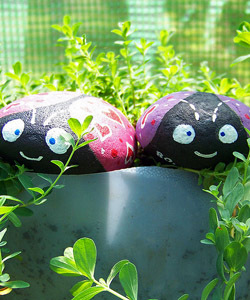 Make a pebble your pal by transforming it into your favorite creature. For added fun, paint a dozen and “hide” them throughout your neighborhood to surprise and delight passersby. Unlike eggs, they won’t go rotten! Photo by Avia Venfica (cc). What do kids love more than pizza? What about growing their own pizza toppings? Spring is the perfect time to get a garden started—all you need are some seeds and a container or two. If you don’t feel like splurging on flower pots, get creative and use old books or a recycled milk jug. Download our guide to starting a pizza garden or watch this video. Photo by Rachel Tayse (cc). 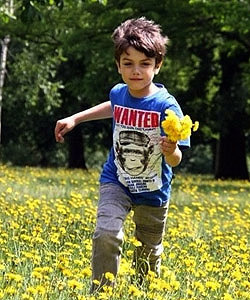 Does your family have a favorite springtime game or activity? Share your ideas in the comments section below, or send us a tweet (@kaboom).